"Superstore" redirects here. For the hypermarket chain in Canada, see Real Canadian Superstore. For the NBC sitcom, see Superstore (TV series). For the disk compression software, see SuperStor. For other uses, see Supermarket. A big-box shopping center in Paramus, New Jersey, that includes an IKEA (not pictured), a Christmas Tree Shops store, and a Bed Bath & Beyond store. 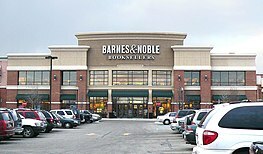 It is located across from Westfield Garden State Plaza shopping mall. A big-box store (also supercenter, superstore, or megastore) is a physically large retail establishment, usually part of a chain of stores. The term sometimes also refers, by extension, to the company that operates the store. The store may sell general dry goods, in which case it is a department store, or may be limited to a particular specialty (such establishments are often called "category killers") or may also sell groceries, in which case some countries (mostly in Europe) use the term hypermarket. Large, free-standing, cuboid, generally single-floor structure built on a concrete slab. The flat roof and ceiling trusses are generally made of steel, and the walls are concrete block clad in metal or masonry siding. The structure typically sits in the middle of a large, paved parking lot. It is meant to be accessed by vehicle, rather than by pedestrians. Floor space several times greater than traditional retailers in the sector, providing for a large amount of merchandise; in North America, generally more than 50,000 square feet (4650 m2), sometimes approaching 200,000 square feet (18,600 m2), though varying by sector and market. In countries where space is at a premium, such as the United Kingdom, the relevant numbers are smaller and stores are more likely to have two or more floors. Commercially, big-box stores can be broken down into two categories: general merchandise (examples include Walmart, Kmart and Target), and specialty stores (such as Home Depot, Barnes & Noble, or Best Buy) which specialize in goods within a specific range, such as hardware, books, or consumer electronics respectively. In the late 20th and early 21st centuries, many traditional retailers—such as Tesco and Praktiker opened stores in the big-box-store format in an effort to compete with big-box chains, which are expanding internationally as their home markets reach maturity. Big-box development has at times been opposed by labor unions because the employees of such stores are usually not unionized. Unions such as the United Food and Commercial Workers Local 770 and the Joint Labor Management Committee of the Retail Food Industry have expressed concern about the grocery market because stores such as Kmart, Target, and Walmart now sell groceries. Unions and cities are attempting to use land-use ordinances to restrict these businesses. 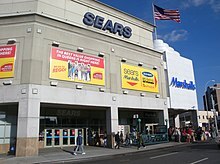 2011 photo of a Sears big box store with subway station in Rego Park, Queens, New York City, New York. This location closed in 2017. Because it is generally inaccessible to pedestrians and often can only be reached by motor vehicles, the big-box store has been criticized[by whom?] as unsustainable and a failure of urban planning. The first company in Australia to use the big-box model was IKEA beginning operation in Australia in 1975. Bunnings Warehouse followed in 1995 and Mitre 10 Australia adopted the model with the "Mitre 10 Mega" stores first opening at Beenleigh, Queensland in 2004. Costco has since expanded across Australia since opening its first store in 2009. Apart from major American big-box stores such as Walmart Canada and briefly now-defunct Target Canada, there are many retail chains operating exclusively in Canada. These include stores such as (followed after each slash by the owner) Hudson's Bay/Home Outfitters, Loblaws/Real Canadian Superstore, Rona, Winners/HomeSense, Canadian Tire/Mark's/Sport Chek, Shoppers Drug Mart, Chapters/Indigo Books and Music, Sobeys, and many others. The indigenous Loblaw Companies Limited has expanded and multiplied its Real Canadian Superstore (and Maxi & Cie in Quebec) branded outlets to try to fill any genuine big-box market and fend off the damaging competition that a large Walmart penetration would inflict on Canadian-based retailers. In the early 21st century, commercial developers in Canada such as RioCan chose to build big-box stores (often grouped together in so-called "power centres") in lieu of traditional shopping malls. Examples include Deerfoot Meadows (Calgary), Stonegate Shopping Centre and Preston Crossing (Saskatoon), South Edmonton Common (Edmonton), and Heartland Town Centre (Mississauga). There are currently more than 300 power centers, which usually contain multiple big-box stores, located throughout Canada. Most large grocery stores in China are of the big box variety, selling big screen TVs, computers, mobile phones, bicycles, and clothing. Many foreign names appear, such as Carrefour, Auchan, Tesco, Lotte Mart, and Walmart, as well as dozens of Chinese chains. Most stores are three stories with moving sidewalk-style escalators. Some stores are so large as to have 60 checkout terminals and their own fleet of buses to bring customers to the store at no charge. To contend against Carrefour, PARKnSHOP opened the first superstore in 1996 based on the concept of a wet market. Most superstores in Hong Kong emphasizes one-stop shopping, such as providing car park services. Today, PARKnSHOP has more than 50 superstores and megastores, making it the largest superstore network in Hong Kong. The first Wellcome superstore opened in 2000 and it has only 17 superstores. In addition, CRC has four superstores in Hong Kong. However, because Hong Kong is a very densely populated city, the sizes of superstores are considerably smaller than those in other countries. Some superstores are running at deficit, such as Chelsea Heights which therefore has stopped selling fresh fish. Furthermore, some PARKnSHOP superstores and megastores, such as Fortress World, belong to the same corporation, Hutchison Whampoa. Many configurations exist: the hypermarket that sells many kinds of goods under one roof (like French chains Carrefour, Auchan, and E.Leclerc), most of which are integrated within a shopping mall; the supermarket that is a smaller version of a hypermarket; the market located in city centres; the department store, which first appeared in Paris, then opened in other parts of the world; the "category killer" superstore that mainly sells goods in a particular domain (automotive, electronics, home furniture, etc. ); and the warehouse store. India is currently going through a retail revolution, following the introduction of Big Bazaar in 2001. However, even before that, large retail stores were not uncommon in India. Spencer's, a popular hypermart, traces its history as far back as 1863. Similarly, conglomerates, such as Bharti, Godrej, Reliance, and TATA, have over the last decade ventured into large-format retail chains. However, most of the stores opened in large malls and not as independent big box format stores, even though small and medium enterprises (SMEs) still account for the majority of the daily consumer transaction needs. However,the most successful consumer retail chain that took the market and penetrated also to tier 2 and tier 3 cities was D Mart, owned by Avenue Supermarkets Limited. 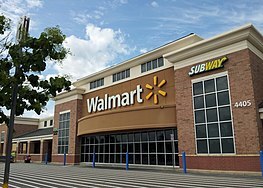 An attempt was made to allow international large format retailers such as Walmart into the country. However, it was successfully opposed by small retailers citing job elimination due to increased efficiency and lowered prices due to fewer losses and lower costs. India's true Big box format store was opened by IKEA in city of Hyderabad. In Ireland, large merchandise stores in the style of U.S. superstores were not a part of the retail sector until the late 20th century. Dunnes Stores have traditionally had a supermarket-plus-household-and-clothes model and now have some large stores. Tesco Ireland now runs upwards of 19 hypermarkets across the country. The big-box phenomenon hit New Zealand in the late 1980s, with the introduction of Kmart Australia and later the "Warehouse" superstore, a local company. Mitre 10 New Zealand opened their first Mega in 2004 at Hastings, New Zealand six months before the Australian Mega store; it opened to great success with 20 more stores opening within two years. Australian-owned Bunnings Warehouse opened its first store in New Zealand in 2006. In the United Kingdom, Makro and Costco membership-only warehouse club stores have been around for 3 decades. General merchandise shops along the lines of U.S. superstores are not a large part of the retail sector, but this has been changing in recent years, with the creation of extra-large supermarkets such as Tesco and Asda selling a broader range of non-food goods, typically in out-of-town shopping centres or retail parks. As in the US, such large shops are sometimes called anchor tenants. The growth of online retail and budget retail has led to these chains moving away from the large out-of-town supermarkets which have waned in popularity. The term "big-box store" is not used in the UK. "Superstore" is sometimes used, but with a slightly different meaning: on road signs it means "large supermarket"; in self-service shop names it denotes an outlet larger than that particular chain's usual size. In the United States, a superstore is usually a type of department store, equivalent to the European term hypermarket. However, sometimes it refers to specialist category killer retailers. Usually associated with large chains such as Target and Walmart, a superstore sells a wide range of products, such as toys, electronics, clothing, groceries, furniture, sporting goods, and automotive supplies. These types of stores advertise "one-stop shopping", where customers can stop just once at their store and buy everything they need or want. Most superstores are located on a single level, unlike other department stores which are often multi-leveled. Meijer is generally credited with pioneering the superstore concept in the United States. The first Meijer Superstore opened in Grand Rapids, Michigan in 1962. By contrast, Walmart didn't open its first Supercenter until 1988. Superstores should not be confused with warehouse club stores, such as Sam's Club, Costco, and BJ's Wholesale Club. While many superstores are as large as some warehouse stores and most are architecturally similar, they differ commercially. Superstores do not require the customer to purchase large quantities of items, nor do they require membership in order to shop. Warehouse club stores are not considered "big-box stores". ^ Kelbaugh, Douglas (2002). Repairing the American Metropolis. USA: University of Washington Press. p. 165. ISBN 0295982047. ^ CQ Researcher: Big-Box Stores. September 10, 2004. ^ "'BIG-BOX' RETAILERS UNDER FIRE PROPOSED CONSTRUCTION OF TWO WAL-MARTS FOUGHT BY GROCERY UNIONS". thefreelibrary.com. Retrieved August 20, 2015. ^ Dunham-Jones, Ellen (2011). Retrofitting Suburbia,. New York, NY, US: John Wiley & Sons. p. 51. ISBN 1118027671. ^ Yin, Jordan (2012). Urban Planning For Dummies. New York, NY, US: John Wiley & Sons. p. 220. ISBN 1118101685.
bigboxreuse.com  Site about how big boxes are reused after retailers abandon them for larger buildings.